I recently moved our church website from WIX to WordPress because it was time to upgrade the website and start doing a lot more with it. One of my main concerns with the website was that some people would go to old links and not be able to find the content they were looking for. So, I turned to a great plugin that I love… Redirection. The redirection plug-in allows you quickly and easily route your traffic to your website. It basically says, If someone comes to Page A on my website, send them instead to Page B. This is useful when you migrate an existing website and you have a few pages people are used to going to, but in the migration, that page might have moved. But as I was playing with the plugin, I found another feature that I had never used before… The 404 Log. 404 is the error people get when they go to a page on your website that doesn’t exist. 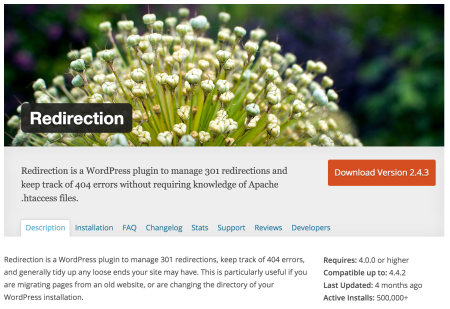 By default, the Redirection Plugin logs a weeks worth of 404 Errors. This means that every time someone came to what they thought was a page on your website but that page had moved, there was a log entry. By using the plugin, I found three important pages that people were going to. So I added the redirects to send those visitors to the correct page. The 404 log helped me find where people were mistakenly going and send them to the right places rather than giving them an ugly 404 Error Page. I’m sure this plugin can help you too as you manage your small business website.